[San Francisco], 1956. 1st printing. ASSOCIATION COPY, INSCRIBED by Kever on the ffep to one "Clay", thanking him for the assistance on the series. Original red buckram cloth binding, with gilt stamped lettering to spine. Modest wear to binding. A VG copy.. Misc. paginations: preliminaries - 4 pp; each of the 12 program scripts - 8 to 14 pp. ~ 25 binder's blank leaves at rear. Illustrated with 12 original photographs of the divers muscians, etc. that performed during this series. 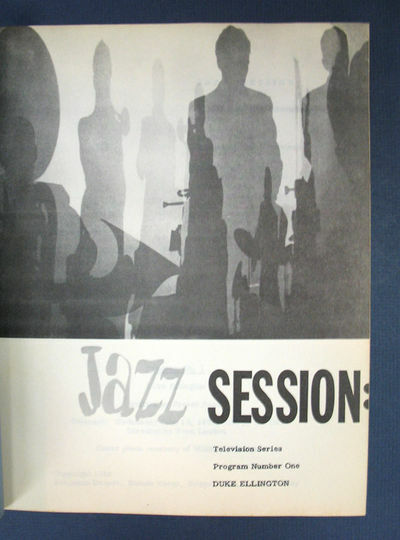 10-7/8" x 8-3/8"
The volume contains the scripts for the 12 programs produced for this series: 1- Duke Ellington. 13 June 1956. 2. Dixieland Swing. Earl "Fatha" Hines. 20 June 1956. 3. The Blues. Clancy Hayes, Ralph Sutton, Lizzie Miles - Soloists. 27 June 1956. 4. Movieland. Andre Previn. 4 July 1956. 5. Birdland. Carmen McCrae & the Australian Jazz Quintet. 11 July 1956. 6. Voices in Modern. The Four Freshmen. 18 July 1956. 7. Hall of Fame. Clancy Hayes, Ralph Sutton, Lizzie Miles - Soloists. 25 July 1956. 8. Louis Jordan. Dottie Smith - Vocalist. August 1, 1956, 9. Jazz Singers. June Christy-Guest; Lizzie Miles & Clancy Hayes - Vocals. 8/8/56.